Alfred A. Knopf. 1940. 322 pgs. First of all, this cover art is not for the book I read; it must be for some recent reprint. One of the fun things about this delightful read was spending time with a very well made, sturdily bound 70 year old book. Who ever “Portia G. Hamilton” of Phoenix Farm(s) was….and whose fine, firm signature graces the inside cover of this yellow-bound, only slightly mildewed volume….she must have taken care of her books. I have a friend who loves used book stores as much as I do who recently left Thirkell’s Wild Strawberries on my desk at work with the note: “Must read!” As soon as I finished that, I checked and found to my delight that Thirkell’s Before Lunch had scored a spot on the Guardian 1,000 Comedy list. A quick check with my friend confirmed that she could supply that title as well as any other Thirkell I wanted, and so here we are. If I wasn’t so behind on my challenge reading I would happily spend more time in the world Thirkell created around the lives of English landed gentry families between the wars, known as the Barsetshire Novels after their fictional county. The website devoted to her: www.angelathirkell.org contains a dictionary of her characters that explains their relationships and what books they inhabit, as well as a listing of plot summaries. Both of the Thirkell novels I read are Barsetshire stories and part of the fun was bumping into a couple of characters from Wild Strawberries at a dinner party featured in Before Lunch. Before Lunch features an talkative, older architect and would-be landed gentleman: Jack Middleton, and his forbearing and lovely younger wife, Catherine. The Middletons are visited for the summer by his widowed sister, Lilian Stoner and her two adult children, Denis and Daphne. The plot revolves around several misunderstood love affairs, the threat of a nouveau rich industrialist building a garage on a beloved plot of meadow, and several subplots involving a riot of humorous and well-drawn minor characters. 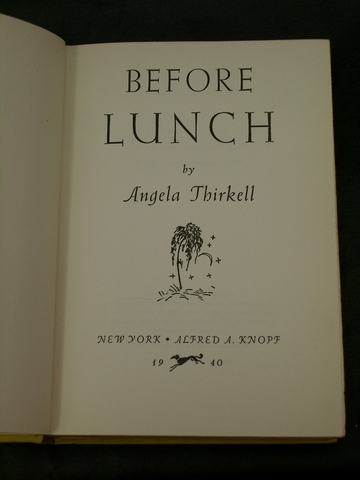 Thirkell was said to be a genius of the everyday and it does seem as though the plot is built on the characters moving between meals, walks, and country dinners. There is gentle social satire in the guise of poking fun at various types — the snooty and overbearing family matriarch, the controlling and scheming butler and the confused, deaf lord. There is some seriousness, too: the beloved heir who never returned from WWI is remembered sadly and lovingly, albeit briefly About half way through Before Lunch I started to get a bit tired of the quotidien treadmill …and then the tension in the love affairs built up, all the subplots got intensified and more wild — but more delicious — and then Thirkell pulled all the threads together in a satisfying, although slightly predictable conclusion. So, are these stories useless anachronisms, museum pieces that we can laugh at or envy…depicting lives with no more worries than out-smarting one’s butler or figuring out who do invite to your next dinner party? I think the thing I take away the most from Barsetshire is the essential importance of laughing at oneself. That is useful in any life — imagined or real. I hope I have time to come back to Barsetshire soon….after cracking down on the Challenge for a while!